In Middlesex County, Nextera has two wind projects up for final public comment: Adelaide and Bornish, totaling 83 turbines, for now. The company’s plan is to connect these two projects, as well as the 92 turbine Nextera Jericho and 62 Suncor Cedar Point projects, with one massive transmission line. Problem is, the route isn’t figured out yet. Remember, the public is supposed to be filing their final comments right now on complete project documents, and yet this very significant piece of information isn’t available for the public to comment on, or even view. The map (above right) shows a ‘proposed’ route – this is all the public, the county, the townships and the Ministry of Environment are supposed to know right now. In fact, this route has not been secured. Landowners refused to sign easements; Hydro Ones said ‘no’ to sharing their poles. 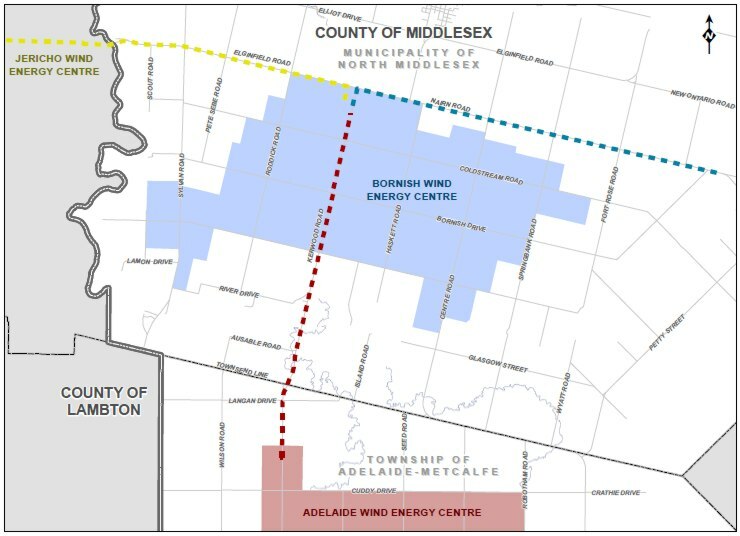 And now Nextera is planning to ask Middlesex County council to allow the company to erect their own 90’ poles with 115kv lines on the other side of the county’s road; hoping that council will ignore the significant safety risk that this will pose to regular travelers by doubling the number of hydro poles on county road allowance. But this isn’t the whole story. Nextera has a plan “C”, lovingly called the “Back Country” route. The locals started cluing into this plan when residents were being approached by CanAcre landmen to sign 100′ transmission easements through the back of their lots— in some cases through mature, hard maple bush. At the final public meeting when company representatives were asked about this route, they twisted away from saying it was so, until they were certain that we were not going to tolerate being lied to. One rep was asked: if they were to use this route, would they not have to have another public meeting to unveil this new plan? Yes, he said they would. But no new meeting has taken place, so we just assumed they were using one of the other routes….until we saw these documents at the MOE office in London (they were only placed on the company’s website 3 days ago, after complaints to the MOE were made). Take a look at pg.11 and on – these are personal notes that the CanAcre landmen took while trying to sign-up the ‘Back Country’ land. Why was this sent to the MOE? Do they intend to still use this route? It would appear that that would still be a big possibility as to this day, CanAcre is still making their rounds in the community, trying to get the land signed that they need. What would this ‘Back Country’ route look like? Nextera of course does not have a map available, but residents were able to piece it together by basically following the plow lines in the fields and assembling the map below. The Red line is the “Back country” and the Yellow is the current Proposed Line. Be sure to follow those lines, right through the woodlot— and remember this is supposed to be ‘green energy’. Does it not fly in the face of reason that council and the public are only now being shown all the various transmission routes that this company is contemplating? We are in the middle of the final 30 day comment periods for both the Bornish and Adelaide projects – this is the last time the Ministry of Environment allows us to comment on these projects. 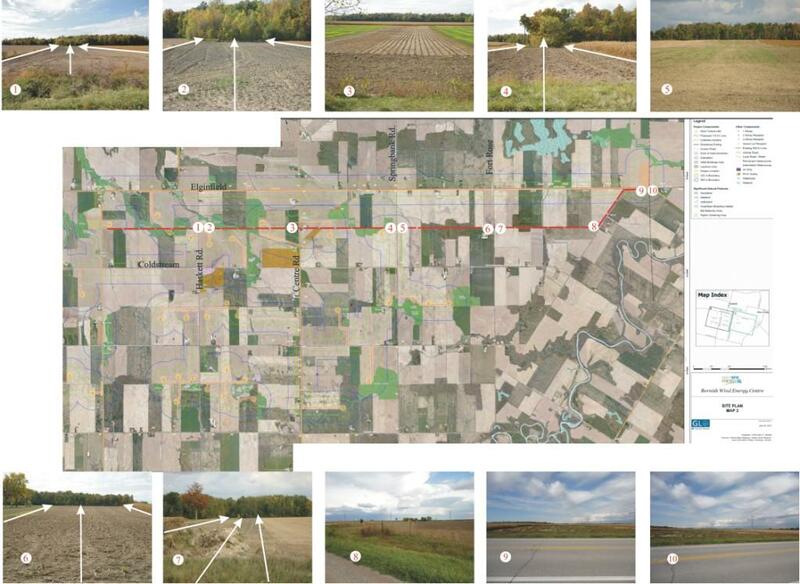 If the MOE has truly reviewed all of Nextera’s Bornish and Adelaide Project Documents, and deemed them complete so that we could review them – does it not seem like they may be missing a large piece of the puzzle, of WHERE the transmission lines are going? We know of three different transmission routes: on Hydro One’s poles, on the other side of the county road, and the ‘back country route’ – all of which are still being actively pursued by the wind company. We are being asked to comment on incomplete and unavailable information… or perhaps they do not wish to have the public’s comments and that is why we are left out of the decision making. Posted on November 28, 2012, in Adelaide Project- NextEra, Bornish Project, Cedar Point Project, Electrical Pollution, Environment, Ethics, Health, Jericho Project, Ministry of Environment, Municipalities, Next Era, Property value, Safety, Suncor, Transmission and tagged hydro poles, middlesex county. Bookmark the permalink. Leave a comment.